One would assume that the site of so many land speed records would naturally also host a foot race too, right? 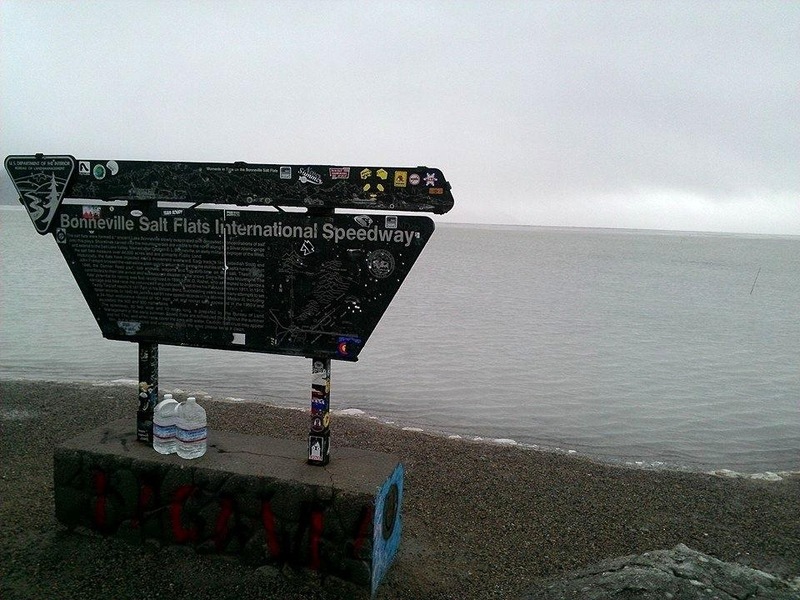 Enter the Salt Flats 100 at the Bonneville Salt Flats on the border of Utah and Nevada. This race crosses over and around 6 foot deep salt as far as the eye can see. The course itself is generally known for being a fairly flat and flat course as far as trail races in the Western US go (with 5500 ft of climbing for the entire 100 mile course), but this year brought some serious, unanticipated challenges. Overnight temperatures in the low 40’s, 20+ mph winds, and rain/sleet for most of the run created brutal conditions for those toeing the line this year. As a result, I heard that more than half of the field resulted in a DNF. Flashback to six days before the race, Tim, one of the runners in the local Wasatch Mountain Wranglers group reached out because one of his pacers had to cancel on short notice. Once I found out I was available, I jumped at the chance to help him with his first 100 miler and I am glad I did (despite the brutal weather). Not only did it line up nicely with my current training long runs, but I have never paced someone before and have been looking for a great opportunity. After working out the details with Tim, my job was going to be picking him up for the last 20 miles and getting him to the finish line. Since the dirt road access to the aid stations make them tedious to get to, I decided to get to the salt flats a bit early and help shuffle around our cars so that we didn’t have to worry about fetching them later. I got there in time to meet up with Tim at aid station 10 (mile 67) at around 9:30pm where he picked up his second pacer, Matt. The rain tapered off during the afternoon and had held off most of the evening up to that point. Tim was getting back into a groove after digging out of some earlier dehydration issues. After Tim and Matt took off, I took DJ, Tim’s first pacer, back to his car and then headed for aid station 12 (mile 80) to wait for our next hand off. The rain started back up again at around 11:30pm and would not let up for the remainder of the race (lucky us). At about 1:30am Tim arrived in good spirits considering he had already covered 80 miles. In fact, he looked like he got a second wind from the last time I saw him 13 miles earlier. We took care of business at aid 12 and were on our way. Two miles in, we hit the longest, steepest climb of the course, which actually kept us warm with the effort. I tried my best to not push Tim too hard, but also maintain a strong pace with our hike up this climb. The runners were pretty spread out at this point, but we managed to run into a couple and chat for a few before we went pushed forward to the next aid station and moved on to the next descent. Over the course of the next 10 miles and 2 aid stations, the weather really started to turn cold and windy. With mostly downhill and flats for the rest of the course, the deep cold was hard to shake. I luckily brought an extra poncho and pair of dry gloves that I was able to give to Tim who was struggling with it on top of his fatigue. We played leapfrog with Davey Crockett at the last few aid stations as he was also spending some time warming up at each one. He eventually passed us on the last stretch and finished about 15 minutes ahead. For the last 5 miles, we were following the main speedway road down to the finish line. This road follows the salt flats, and with no cover, the cross winds were downright awful. With a mile left, Tim’s wife joined us to the finish line. He crossed in 24:26 to finish his first 100 miler. As I mentioned, this was my first time pacing, but just like my recent volunteer experience, it makes me yearn even more to complete my own 100 mile journey. Watching Tim cross, seeing the look of joy mixed with exhaustion on his face, and witnessing him through those last 20 miles were priceless to me. Yes, the weather wasn’t ideal, but that didn’t matter in the least. I got to be a part of his amazing accomplishment and hopefully did my best to contribute to a memorable experience for him. I am grateful for that. Tim is a stubborn, determined badass…in a good way! I am never signing up for an early season 100…the cold overnight is brutal and is only made worse if you end up with bad weather too. Most importantly, pacing is an awesome and rewarding experience and is a true testament to the camaraderie that we share in the sport we love. 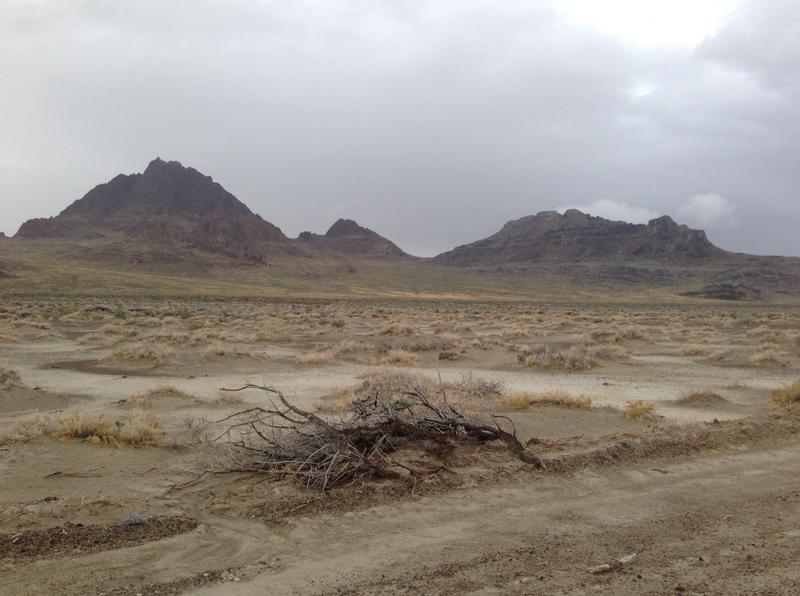 Picture of some of the mountains off of the side of the Salt Flats on the way to Aid Station 10. This entry was posted in Race Reports by Ultrarunner Joe. Bookmark the permalink. It sounds like you enjoyed pacing. I really loved my recent pacing experience. Funny how it makes us crave that hundred mile finish!